You may not know it, but you have round-the-clock protection against the increasingly savvy perpetrators of debit card fraud. That's because the Visa Check (debit) Cards we issue are protected by FraudWatch® Plus.Through an important partner of ours we provide industry leading technology, tools and the expertise to manage fraud. Experienced fraud analysts work around the clock, watching for any suspicious card activity and will contact you immediately if they detect potential fraud on your card. It's fast, convenient and ready to use. 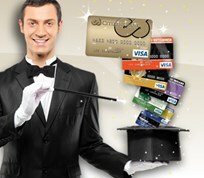 Come in and apply for your new Debit or ATM card and you will receive it in minutes! If you have a lost or stolen Debit or ATM card we also have a rapid replacement for you. For more information call 573-237-3051. Take action TODAY to ensure you will never have a transaction denied at any of your favorite stores! Contact you local branch to learn more or download this form to OPT IN today.